There is also another way to create paths: follow the movement of the pixels in an animation in time. To do this, you use the Pixel tracker panel. This panel is accessible in the effects requiring use of paths, in the Tools popup menu or directly via the Windows main menu (see the corresponding window below). We will now try to create a path from an eye movement of the Running Kid (see below). When a path is created, we may, for example, re-use it with the AutoPaint effect and the pen tool in smooth mode to create a blur on it. 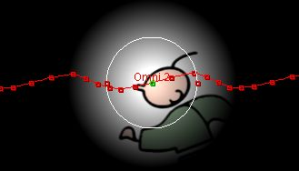 It is also possible to use a lighting effect to create a luminous spot following the movement of Running Kid, etc. Opposite, the path of the eye was re-used with Omni lighting. * In the first section, you must define the layer on which the character whose movement you wish to follow (or any other element) is located. Two time or frame markers determine the section of the layer that will be taken into account for pixel tracking (the entire layer, by default). 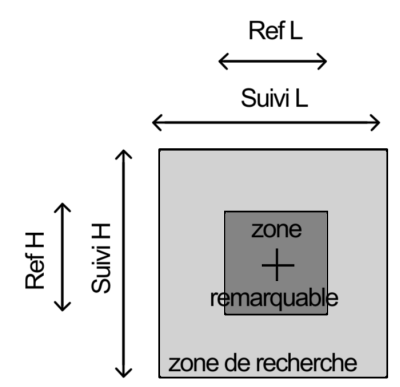 * In the second section, you must define a focus area within the current image. The Pixel Tracker will try to find this in the following images of your video in order to create a path. To "follow" a human face, i.e. to create a path from the face, the eye is often used to define the focus area. The values Ref X and Ref Y are used to choose the center of this focus area and the values Ref W and Ref H to set its width and height. The parameters Track W and Track H will limit search in the focus area to the number of pixels in length and height of your choice, around the focus area of the first image (see diagram below). When the pixel tracker tool passes from one image to another, it will memorize the focus area of the first image and try to find it in the next image in the tracking area. This enables creation of the position keys necessary for path creation. If HUD display is enabled after having clicked on the Set tracker button, you may modify these parameters directly with the following combination : [Ctrl+right click+slide the mouse] or [Ctrl+left click+slide the mouse]. The Reference popup menu is used to choose if the reference "focus area" for the process is always that of the first image selected or will be updated as tracking progresses. The Channel menu will, depending on your choice, restrict the channels to which analysis of movement tracking will be applied. The Accuracy popup menu allows you to define the complexity of the concordance test. If you choose 1-1, the test is carried out at pixel level. The tracking is then fairly rough. If you choose 1-64, the pixels determined by the 1-1 test will be moved 64 times by a 64th of a pixel in order to fine-tune tracking. * The fourth section is a zoom on the focus area you have selected. The Track button starts the process of creating a path with the chosen parameters whereas the Rev. Track button has the same effect but reverses the path.